The Baltimore Checkerspot Butterfly, (Euphydryas phaeton,) has been the official arthropodic emblem of the State since 1973 (Chapter 253, Acts of 1973; Code State Government Article, sec. 13-301(a)). Although the law that made it the State Insect did not give a reason for the designation, certainly the Butterfly's name endears it to Marylanders, and its black and gold repeat the family colors of George Calvert, the 1st Lord Baltimore. Butterflies, like bees, are pollinators of crops and wild flora, and the Baltimore Checkerspot is no exception. 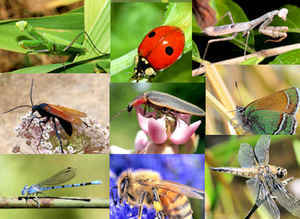 Its body or thorax is dark brown, a color which extends to its wings, spotted white and then orange on their edges. 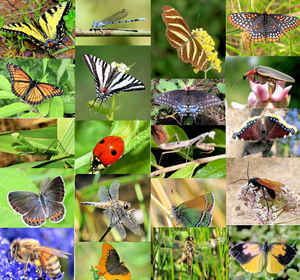 As part of the family Nymphalidae (Brush-footed Butterflies), it bears hairy forelegs too short for walking. The prominent knobs on its antennae also are a trait of this butterfly family. Like other butterflies, the Baltimore Checkerspot searches for one kind of host plant from which it will gain nourishment during its period of growth. In this case, the Turtlehead (Chelone glabra) is the only host plant that this butterfly will use. In wet meadows and ditches, the Baltimore Checkerspot Butterfly seeks out the Turtlehead, a creamy white pink-rimmed flower of the snapdragon family. Here, it lays eggs on the undersides of the plant's leaves. In summer, the eggs hatch into orange and black caterpillars (larvae) which feed off this host plant. Over a period of a few weeks, each caterpillar, as it grows, will molt or shed its skin several times before reaching its full size. Following the last molt, the pupa or chrysalis appears. Within a flexible shell, the chrysalis is a semiliquid in which the butterfly forms. From it emerges an adult butterfly. 1 3/4 - 2 3/4 inches (4.5 - 7 cm). Geographically variable. 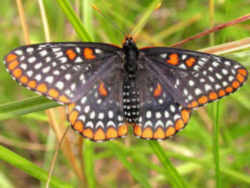 Upper side is black with red-orange crescents on outer margins of both wings and rows of creamy white spots inward. Males perch near the ground to find females. Eggs are laid in groups of 100-700 under host plant leaves. Newly-hatched caterpillars move to the tip of the plant and feed together in a web which is enlarged downward as the caterpillars consume more of the plant. These caterpillars suffer high mortality from falling off the plant and from parasitism by wasps. Fourth-stage caterpillars hibernate in rolled leaves on the ground. One brood; from May-June in the south, June-August in the north. Plants where eggs are laid and that caterpillars eat before hibernating are turtlehead (Chelone glabra), hairy beardtongue (Penstemon hirsutus), English plantain (Plantago lanceolata), and false foxglove (Aureolaria). After overwintering, caterpillars may continue to use these plants, but may also wander and feed on unrelated plants including arrowwood (Viburnum recognitum), common lousewort (Pedicularis canadensis), Japanese honeysuckle (Lonicera japonica), and white ash (Fraxinus americana). Nectar from flowers of milkweed, viburnum, and wild rose. 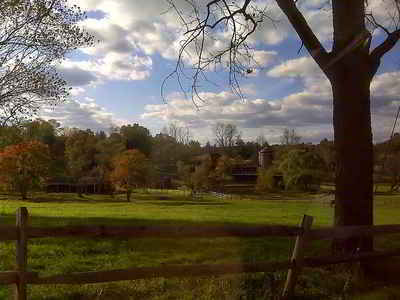 Wet meadows, bogs, and marshes in the northeast part of the range; dry open or wooded hillsides in the southwest. Very local. Nova Scotia west across the Great Lakes region to southeast Manitoba; south through the eastern United States to northern Georgia, northern Mississippi, and northeast Oklahoma. Isolated records in northeast Texas and Nebraska. The law designating the Baltimore Checkerspot Butterfly as the official Maryland state insect is found in the Maryland Statutes, Title 13, Section 13-301. TITLE 13. EMBLEMS; COMMEMORATIVE DAYS; MANUAL. 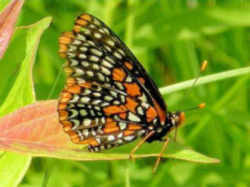 (a) The Baltimore Checkerspot Butterfly (Euphydryas phaeton) is the State insect. (b) The Maryland Blue Crab (Callinectes sapidus) is the State crustacean.